Woo hoo! I’m down 5 pounds in as many days – I couldn’t believe it when I stepped on the scales for my early morning daily weigh in. 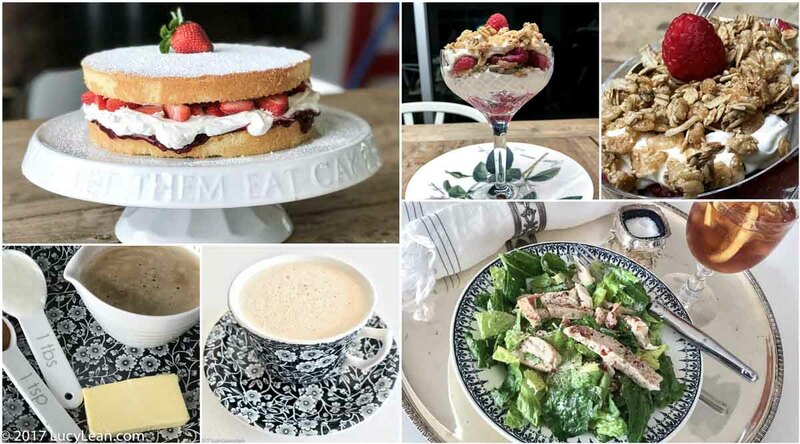 I pay myself $20 per pound so I’ve made $100 in 5 days… it seems rather improbable to be eating such rich delicious food and dropping pounds but it’s working and I feel so energized. 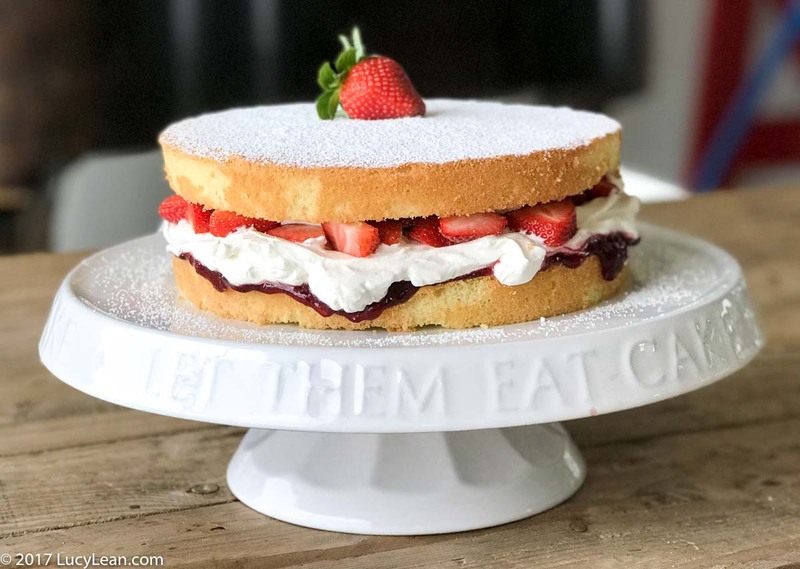 Last night I had a slice of pizza and a slice of cake – so I’m beginning to feel that this Delicious Diet should have the sub-heading “Have your cake and eat it too!” I posted how to make this delicious Victoria Sandwich Sponge Cake today – it’s from Yotam Ottolenghi’s new book Sweet with Helen Goh – totally yummy. I gave a slice of the leftover cake to Peggi to give to Greg – I wonder how much was left when she got home ; ) – but thanks to the Butter Coffee I didn’t have the urge to raid the fridge and eat another slice today… now that’s a first. Last night I booked bikes at Soul Cycle for me and Peggi in the back row for the 9.30am class. This is a must for me to do this the night before, not just to reserve a space but to make myself go. The class was great – rather noisy but good music and lots of positive affirmations yelled out to Friday Hollywood! I peddled fast and hard, tried to figure out how to keep up with the sets of dips, push ups, side to side etc. I even managed to do nearly all of the hand weights – definitely something I’m not great at but improving. Mostly I kept moving and worked up quite a sweat. Peggi offered to take a photo of my red sweaty smiling face post class but I felt too self conscious. There were the usual mantras about committing to yourself, pushing yourself to be your best and getting the most out of life. Something along the lines of it being possible you just had to have the vision so I was chanting to myself “Impossible = I’m possible = it’s possible.” The euphoria is real and the post spin class high lasted well into the late afternoon. 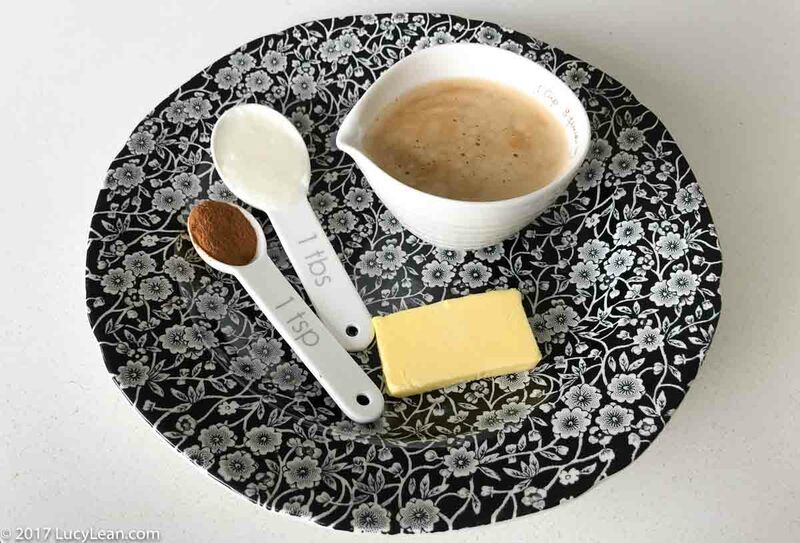 After the class Peggi came home to try my latest obsession – Butter Coffee. I made up a batch in my blender and we sipped the decadent, rich and creamy concoction together. Then I had the idea to add freshly ground cinnamon to the top – I swear it’s almost egg nog. Whilst I was so tempted to add a glug of cognac there’s no booze for me – and I’m being strong. Tonight I was thinking about making myself a Champagne cocktail on the drive home, it being Friday and the weekend, but then I got in the kitchen and started baking a vegan chocolate cake for Ilse and suddenly it was late and Didier was home and he ate the Caesar salad and left over pizza and I ate a delicious raspberry parfait. Now I’m headed for a long lovely bubble bath, bubbles of a different, healthier sort! Butter Coffee almost Egg Nog – not really a proper breakfast tray and not even a meal but rich and satisfying and it set me up for a good day and the caffeine gave me a buzz. The key is not grazing between meals and the butter coffee really seems to stop me from doing this because it’s so filling. Place in the blender and whizz for about 30 seconds until completely emulsified and the butter has melted. 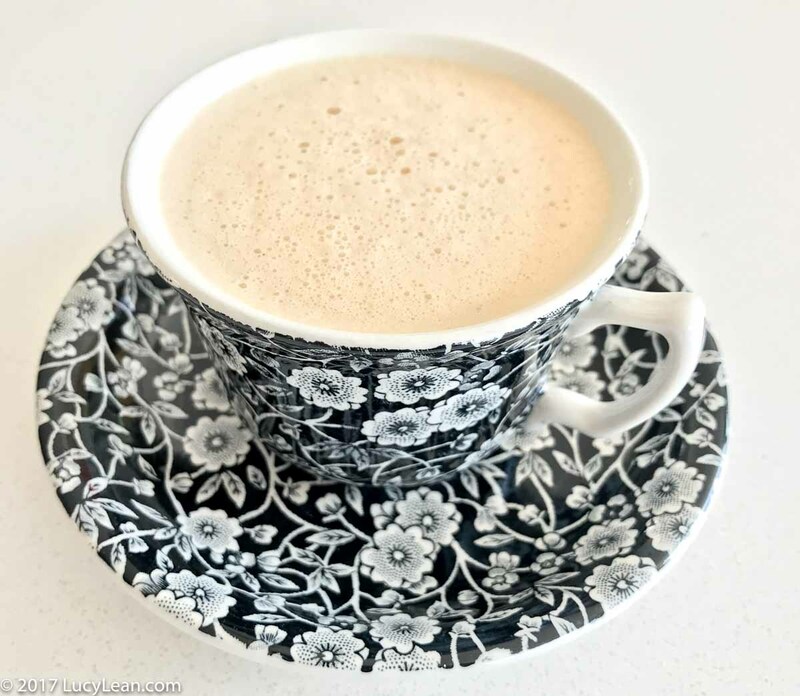 Serve in a pretty coffee cup and freshly grate nutmeg onto the frothy top for an egg nog-esque taste sensation. 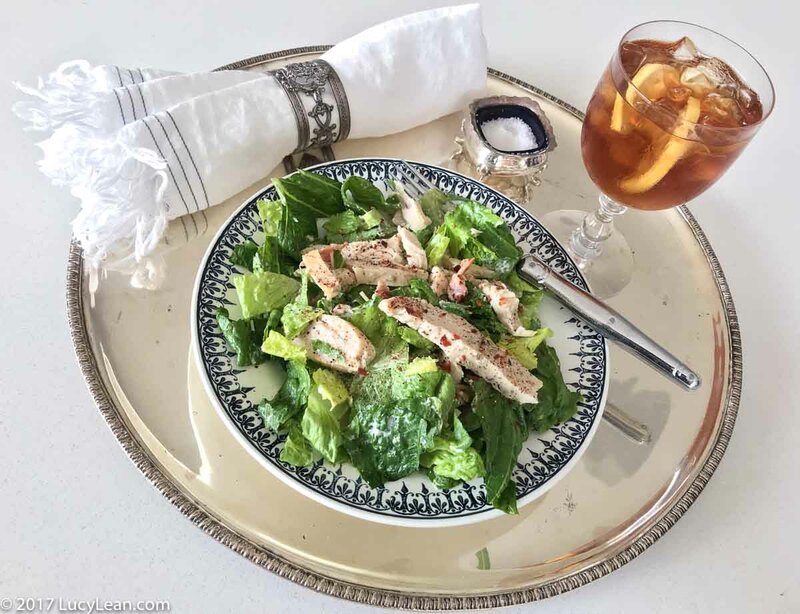 Caesar salad with chicken for lots of protein (and very little dressing but lots of chili flakes to spice up the metabolism) and homemade unsweetened iced tea with lemon. 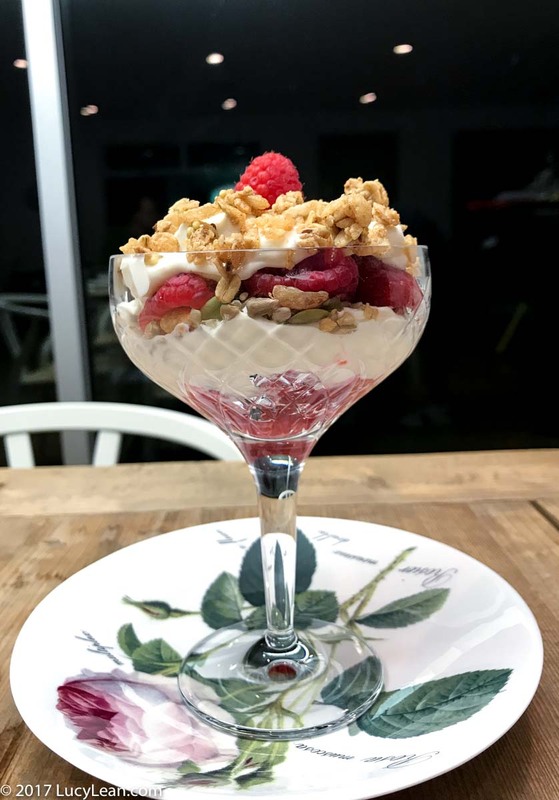 Raspberry Parfait with organic full fat Greek yogurt from Straus Family Creamery and a sprinkling of cinnamon granola.